Roman Gladius Swords are 31 inches in all. 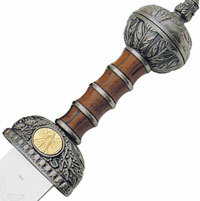 These swords have a mirror polished blade, an ornate pommel and include a free stand. The display ready factory-edged 22 1/8th inch shiny blade features decorative etchings. The simulated wood handle features a traditional finger groove with antique silver finish metal spacers. The cast metal guard features a polished brass colored metal inlay. 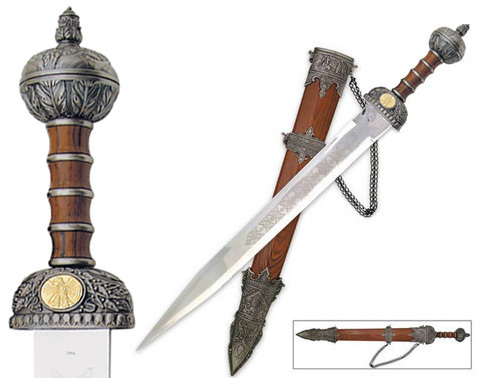 The wooden scabbard is decorated with antique silver colored metal fittings and a metal chain. These swords include a wooden tabletop display stand with a customizable brushed gold plaque. The plaque can hold a logo (see above) with two lines of text or up to three lines of just text (see samples above) in various fonts. Contact Customer Service via email or telephone after purchased to submit your laser details and design choice. Buy these popular Roman Gladius Sword display sets for only $79.99 each. To use your logo, with or without text, the logo must be available to be viewed in a browser online. The logo must be high resolution or a vector image. Slight modifications are sometimes needed to make the logo compatible with the size and width of the blade. Please do not email your logo without it being requested, it may be deleted as spam. Contact Customer Service directly via email or phone after this service has been purchased to submit your text, style and/or with any questions regarding this process.